I’ll be updating this page with a real gallery soon, actually the whole damn site is going to be remodeled. But I’m sick of all the emails from the ladies asking to see pictures of me, so here you go! Here’s a picture I (Birdman) took while on vacation in Puerto Rico, we were riding through mountains and farmlands. When we stopped for a potty break, I saw this really weird looking dog, so I took a picture of it. It also barked very differently than American dogs. There’s a lot to be said about people that wear members only jackets: They are very trust worthy, they have a sense of style, and they know what they want in life. Seahorse exemplifies all of this as we can see here. They also appreciate the finer things in life, here we see Seahorse enjoying a quality smoke with a rich smooth blend of coffee. In a recent press conference with President Bush, Seahorse went into his attack mode, because he feared for the life of the president. Later behind closed quarters President Bush extended his thanks and mentioned that true heroes like SeaHorse don’t look to shine in the spot light and thanked him for saving his life. 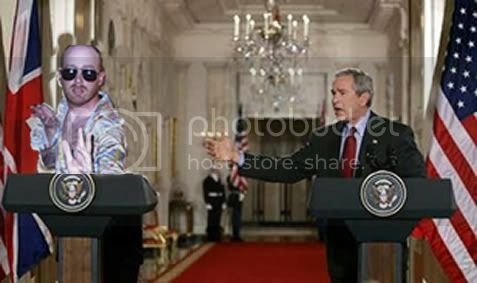 We are also very important members in the public forum and meet regularly with world leaders. Our input is very valuable to them, and are always on call in case an international crisis arises. 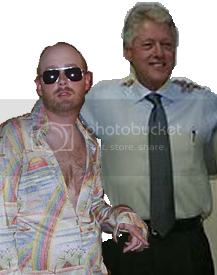 Here is SeaHorse meeting with former president Bill Clinton in the aftermath of hurricane Katrina. Seahorse was invited to the hit show…Dancing with the stars, hopefully we will be invited back for the new season. You guys are totally insane….and exactly howI remember you. Two talented individuals with some great views on the this one life we get…Sometimes its not what the words say its how they are written…Keep up the good work! !